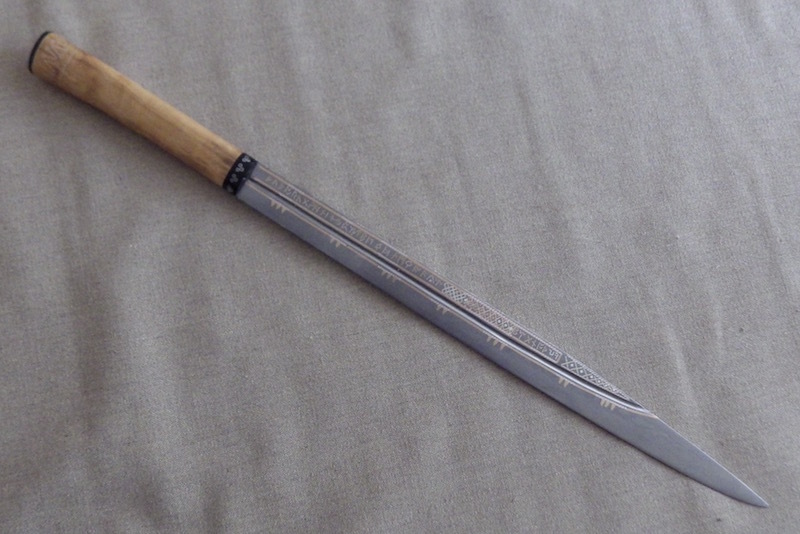 This is a reproduction of the very iconic Seax of Beagnoth from the British Museum. A 10thC langseax with a heavily wire inlaid blade. I have tried to reproduce this as faithfully as I can using a blade supplied by Owen Bush, forged from his own smelted iron and shear steel and inlaid by myself. The handle and sheath are speculative and have taken elements from various contemporary finds to create a piece 'that could have been' The handle is horn and box wood and inlaid with silver. I hope you like it and please ask if there is anything you would like to know. Possibly the most iconic seax is the Seax of Beagnoth in the British Museum and one I have wanted to reproduce for many years and I now have the opportunity thanks to an MA Alumni. 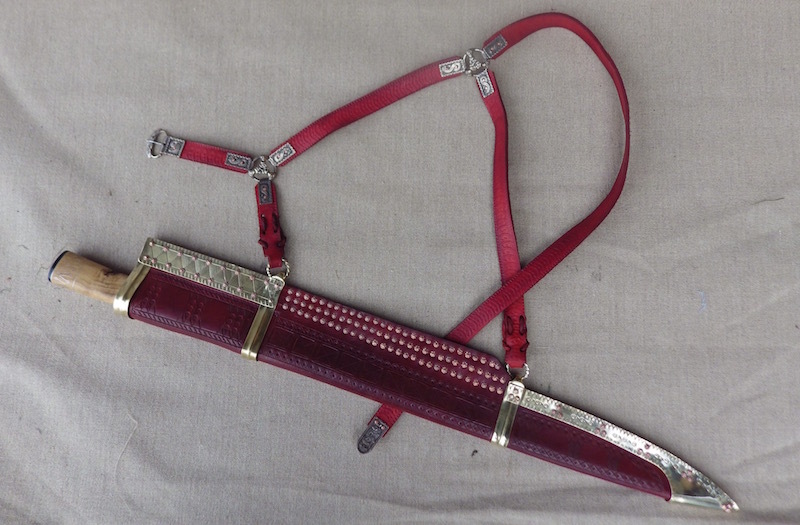 This is a classic 10thC Langseax with a 55cm/22" blade of the broken back type and is long and beautifully elegant. What really makes it stand out is the very elaborate Futhorc alphabet inlaid in wire on one side and the name Beagnoth on the other. 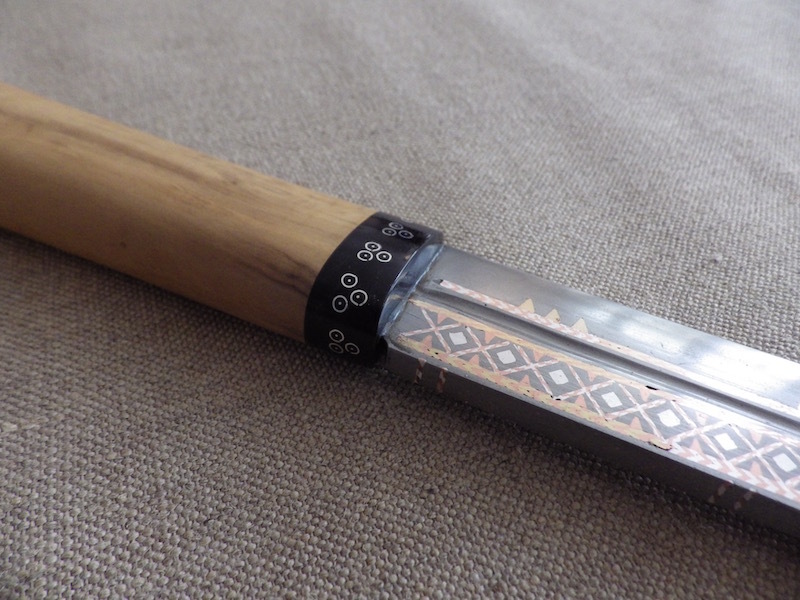 There is considerable further wire inlay in geometric patterns on both sides of the blade as well as the spine. The origin of the blade is most probably Kent as the only two renderings of the name in manuscripts are from Kent and the alphabet used, also best fits that from Southern England. Thanks to Ryan Renfro who arranged a visit to the BM in December last year, both myself and Owen Bush were able to measure, handle and photograph the seax first hand and see the 'other' face that is almost never on display. We were also able to get a very close examination of the wire inlay. The inlay is executed in silver, brass and copper in what appears to be a fairly random manner, so that even parts of the same letter could have two different combinations of twisted wire. Although this appears random, it was deliberately done and was not, in our opinion, after use repairs. We have opted to try to replicate the inlay as faithfully as possible and this will include the apparently random materials choice. What is also interesting is that there is a partial break near the 'broken' part of the back that has caused the tip of the blade to rotate around. This means that the very distinctive and elegant form of the blade is in fact not what it would have looked like in life. We have opted to shape the blade more in line with how it would have originally been. Completely unrelated to this visit my client contacted me to see if I was interested in making as faithful a reproduction as possible, a chance at which I jumped, and of course for me there would only be one person to contact for the blade, my old friend Owen. I discussed the project with Owen and my client and we settled on making the blade from bloomery steel that Owen smelted himself from a variety of ores. The blade construction and make up is Bloomery iron and bloomery steel, from 3 separate smelts. The steel is multiply folded magnetite bloom, circa 25,000 layers, and is a high carbon steel. Edge and body is a sandwich of high carbon bloomery steel (25,000 layer) with a mix of bloomery iron from a hematite smelt and bloomery iron from a siderite/magnetite smelt on the outside of the sandwich. 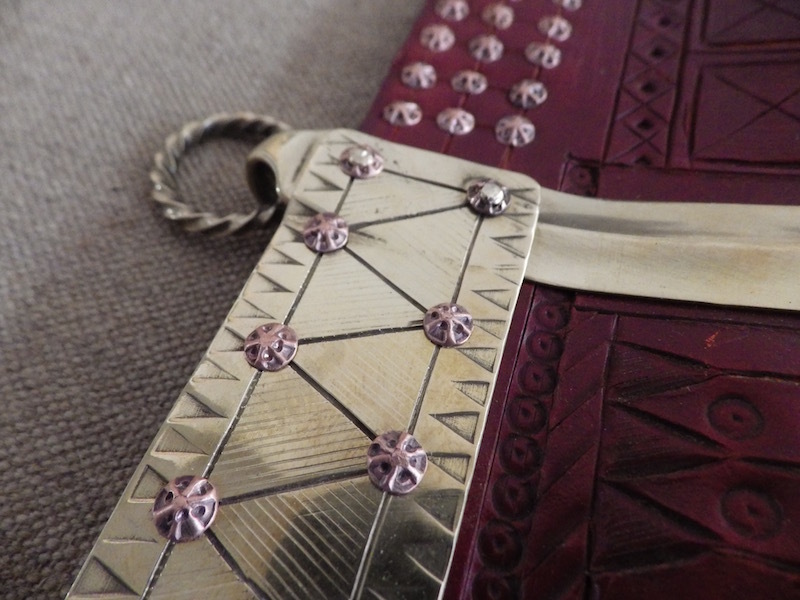 The back edge is laid on its side and is again a mix of the iron and steel layers. Materials are derived from Wealden siderite from Kent, Swedish magnetite and hematite which is in fact American. The blade was then Oil hardened in high temperature oil, making for a tough and moderately hard blade, but not as remotely hard as modern steels. This construction method gives a distinctive look that shows through especially post etch, but this will be removed during the inlay process and can be returned by an etch after if required or the blade can be left plain; though general use will cause the pattern to show once more as the blade ages. Magnificent work sir! Thank you for documenting the process. This is one of those iconic blades that needed to be reproduced, and it is wonderful to see it done so well. My hat's off to you and Owen. That is gorgeous. I don't think I've seen anyone reproduce a seax this nice. Incredible work - Well done both Tod & Owen - splendid seax! I really can't wait to have this in-hand! I am sure that I will be even more pleased when I see Beagnoth "in the flesh" as it were. 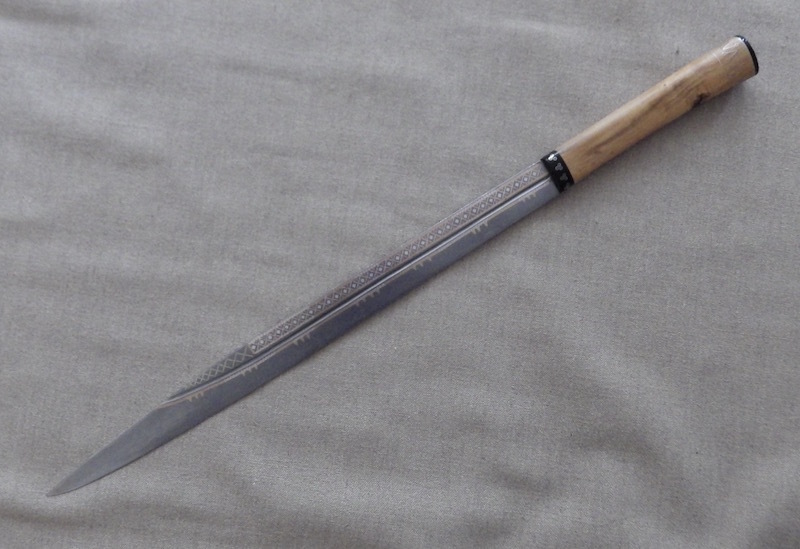 I am trying to imagine how this seax is going to handle and I can only think it will be very assertive in blade presence. Tod has agreed to put together a belt system for Beagnoth and so that will finish the whole affair. I will certainly post up more pictures when I receive it. It's been great watching the entire process unfold and I thank Tod for documenting this. It really shows the care and time that went into the making of this piece. 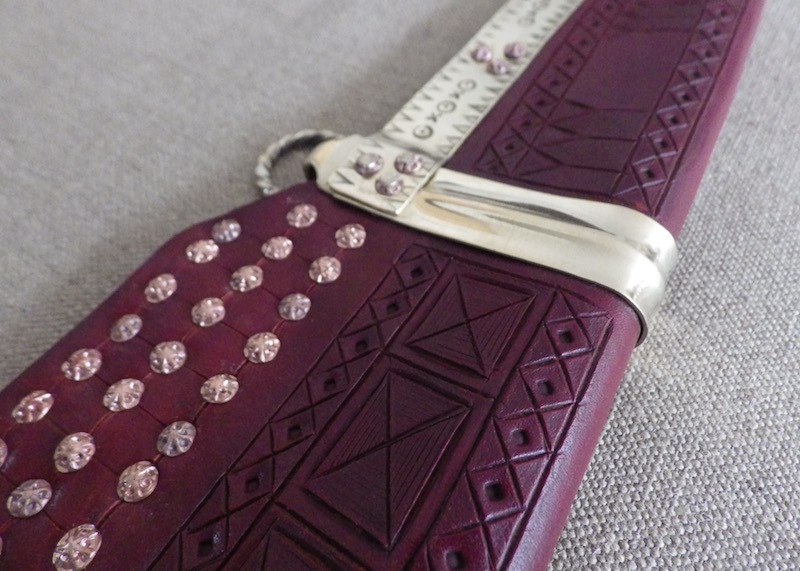 And here is the belt. Terrific job guys, this is a great thing to see. Only thing missing are some in-hand and "around waist" in belt shots so Jeremy, we will all hunt you down somehow if you neglect those. Really great! This is fabulous and I regret I am not going to be the owner. Just plain jealous. I want it. I want it. I want it. So after a lot of problems with shipping and with especially with customs I finally got my newest toy. . . . .
And boy, is she a monster! First I can't thank Owen and Tod enough for the fine work they did on this piece. It is beautiful. The blade is amazing and show all kinds of activity if you look closely. The inlay on the blade is phenomenal- just phenomenal. The silver inlay in the handle is also flawlessly executed. 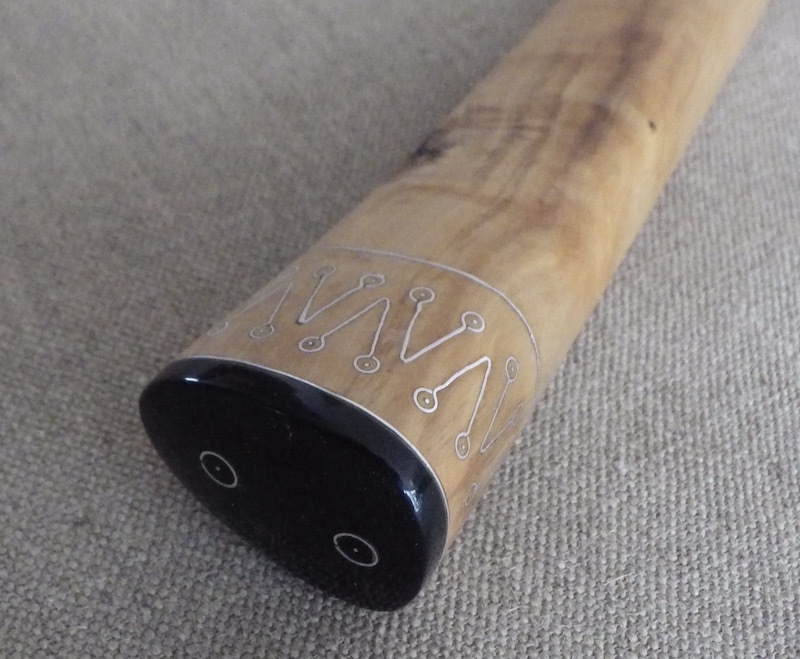 You can barely feel where the inlay in the wood lies since it is so tightly and neatly done. The scabbard is also excellent- showing just the amount of detail a weapon of this status needs. I was most surprised just how massive this blade is. It certainly has a lot of blade presence and I will echo what Tod states about how the owner of the original specimen must have had a strong arm indeed in order to bring this up to speed. It would be devastating in the cut. I will post up some pictures when I have more time but I just wanted to acknowledge my first impressions of this fine, fine weapon. Here's one picture I took. Sorry for the low quality. Here is a shot of Baegnoth next to my late-period broken-back seax which is also made by Tod. Hopefully you can surmise how massive this seax is. The blade on the broken-back seax is 12 inches and 22 inches on Baegnoth (I think). And here is one showing it in hand. Sorry that the shot is at an angle so may not give the best impression of it's size. 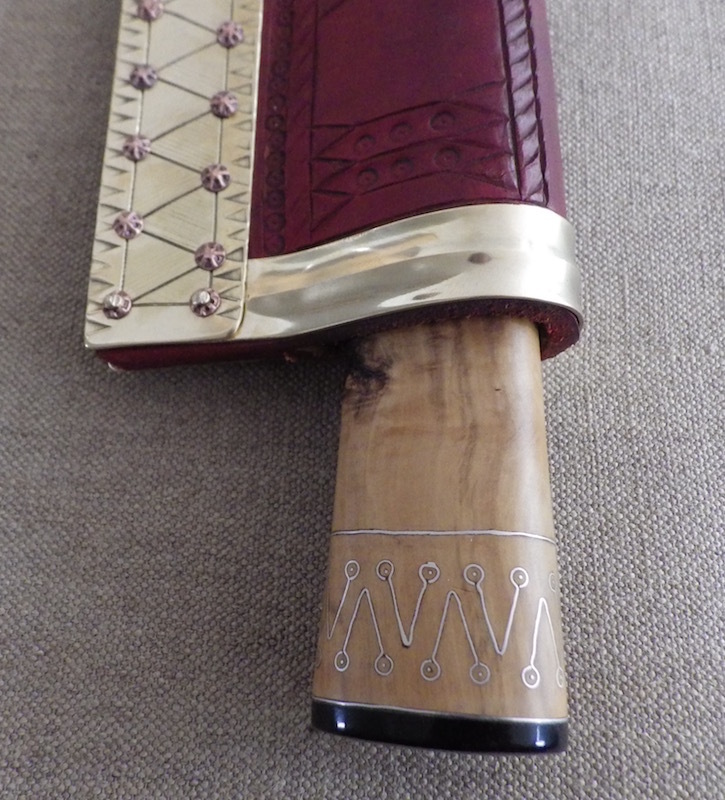 And another of the seax and scabbard.